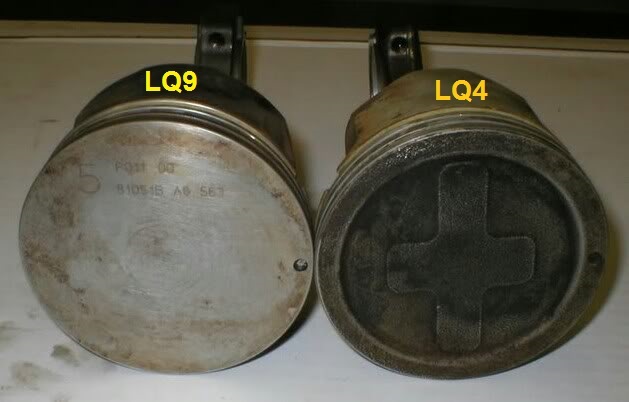 The ONLY difference between an LQ4 and LQ9 is the piston! There are NO embossed or etched exterior markings on the block or heads to indicate one over the other. There is a paper sticker applied to the back of the drivers-side head at time of manufacture that indicates the type of engine. But it is usually missing with a wrecking yard engine. The LQ4 piston is dished where as the LQ9 is a flat-top increasing compression to 10:1, and HP to 345 factory. The LQ9 is a limited production engine and VERY desirable as it is the HO 6.0L and comes with a premium price. Price Considerations: The LQ9 being a limited production engine often comes with about a $1000 premium over a similar age / mileage LQ4. IMO, If you are willing to pay the premium for an LQ9 it is cheaper to start with an LQ4 and do either the Z06 Cam Package (375HP & $700) or the SS Cam Package (425HP & $1000). Transmission Considerations: ALL LQ9's came with 4L60e or 4L65e depending on year. Although the LQ9 is the HO (High Output) 6.0L it came in a 1500 chassis. Any LQ4 from an Escalade or Denali will have been mated to a 4L60e or 4L65e as well. Transmissions were sized to chassis capacities NOT engine horse power ratings. So, ANY (Truck or SUV) that is a 1500 will get the 4L60, a 2500 chassis will be get the 4L80e. You need to understand this if purchasing an engine from me. 4L60's & 4L80's are not electronically interchangeable. The "tune" in the ECM is different as well as the main wiring harness. It can be done but it is considered a conversion and not something I offer. So if you have a particular transmission requirement it is best to choose it first, then find an engine that was mated to it naturally from the factory. “U” is an LQ4, and “N” is an LQ9. NOT all Escalades or Denali’s came with LQ9’s. I have seen many Denali’s with LQ4’s actually. ALL Silverado SS Trucks had LQ9's and I believe ALL Escalades after 2002 got the LQ9 as well. I have seen Denali's of all years have either LQ4's or LQ9's so you have to check. I validate every engine type with the VIN Number first. Then I actually look at the piston type with a bore light and scope. If you are getting an LQ9 a picture of the piston is recorded and kept in your file to validate 100% you are getting what you paid for.